Huntington Castle, Clonegal, County Carlow, the ancient seat of the Esmonde family is today one of Irelands historical treasures. 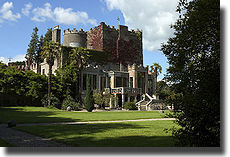 The Castle was built in 1625 as a garrison on the strategically important Wexford to Dublin route. After 50 years the soldiers moved out and the family began to convert it into a family home. Many generations of the family subsequently added various extensions and details giving the effect of a truly unique and interesting building. In the 1970’s the basement was converted into a temple to the Egyptian Goddess Isis, and the present generation continue to renovate and improve where possible. The Castle is still a family home and is open to the public during the summer months and school holidays. Presently lived in by three generations of the Durdin-Robertson family, descendents of the Esmondes, the castle is set in picturesque countryside at the foot of the Blackstairs mountains. The castle has something to offer everyone – from those keen to explore the fascinating house and gardens on a tour – or for those who want to enjoy the tearooms and children's adventure playground. Whatever you are looking for Huntington Castle will have something unique to offer.